Welcome to the six hundred and twelfth of my blog interviews with novelists, poets, short story authors, biographers, agents, publishers and more. Today’s is with multi-genre author Anne Hosansky. A list of interviewees (blogged and scheduled) can be found here. If you like what you read, please do go and investigate further. Anne: I live in New York City and work at home, which means I can get to my “office” in one minute. I didn’t as much “come” to writing, as circle back to it. As a child I was always writing, mainly poems. My grandfather was the first (and only) person to believe I’d grow up to be a writer. You’ll be interested in knowing, Morgen, that he was British, a sports writer for The London Times. When I was a rebellious teenager I told him I was going to be an actress. “You’ll outgrow it,” he predicted. It took several decades, while I did act with various theatre companies. When I gave birth to my second child, I decided it was too difficult to juggle theatre and motherhood, so I stayed home and gained an extra 50 pounds out of boredom. I joined Weight Watchers to lose the pounds and heard that the company was looking for an editor. I applied, was hired, and began writing articles about weight loss. That was the beginning of getting back to my first love: writing. I left the organization after some 18 years, and began writing freelance articles and short stories. What triggered my first book was my husband’s terminal illness and death in 1990. I wanted to write about our bizarre experiences in dealing with doctors. After my husband died, I continued writing about trying to make a new life for myself, writing it as I lived it. The result was my memoir Widow’s Walk. Morgen: Sorry to hear about your husband. They say “write what you know”, and it is easier. Healthy eating has always been a popular subject – Jane Wenham-Jones blogged on my site only this week about her writer’s bottom. 🙂 I’m also based at home and would sit in my pyjamas all day if I didn’t have to walk my dog. You write non-fiction, what else do you decide to write about? Anne: Actually I write both fiction and non-fiction. With articles the idea comes from something I want to say or that seems relevant to the issues of the day. For instance, I’ve written many articles about being a caregiver for a loved one. After Widow’s Walk was published I decided to write about other people’s experiences on coping with loss. I interviewed dozens of inspiring people who also made new lives for themselves. This became my second book, Turning Toward Tomorrow. Anne: In addition to the two books I mentioned, I have a new one – Ten Women of Valor. It’s a totally different topic, our first Biblical heroines from a feminist viewpoint. I’ve also had numerous articles and short stories about a variety of topics published in magazines. I don’t use a pseudonym. However, while working for Weight Watchers I wrote the advice column in the magazine under the name of Jean Nidetch (the founder). My therapist asked whether it bothered me to have my writing under someone else’s name. I thought about that, and haven’t done it since. Morgen: I’d feel the same, unless I was being paid to ghost-write. You’ve self-published, what lead to you going your own way? Anne: My first book was published by a small company, Donald Fine. With my second book, I was trying to get another publisher (Fine had died). Then September 11th happened and loss was everywhere. I wanted to have my book available as quickly as possible, so I went the Print on Demand route with xLibris – a company I don’t recommend. Then with Ten Women of Valor, I decided to brave it and totally self-publish. I took the manuscript and illustrations to a local printer, who did an excellent job. It’s overwhelming to self-publish, because you have to be responsible for every detail. I’m glad I did it, though, because I have a book rather than just a pile of rejection letters. Of course, the bigger challenge in self-publishing is how to market your book. I’m doing that by giving talks in various organizations. Thanks to my acting background I’m a confident speaker. Things really do come around, don’t they! Morgen: Few people recommend xLibris (AuthorHouse is part of the same stable) – I’d always suggest writers go to the likes of Preditor & Editors (http://pred-ed.com) before parting with money. The upside of self-publishing is that you get to meet potential readers directly, although every author these days has to do most of their marketing, so we’d all still have to work hard. Are your books available as eBooks? Do you read eBooks or is it paper all the way? Anne: Since I lost some sales with Ten Women because sales reps didn’t want to order “through the author”, I made the book available at CreateSpace.com. It’s affiliated with Amazon, so the book’s with Amazon as well. I also put it on Amazon Kindle, though it amuses me to think of those ancient women on such a modern contrivance. I myself don’t read ebooks, old-fashioned enough to want to hold a real book in my hands. Morgen: Most people do, or are like me and enjoy both (paper at home, electronic away). 🙂 Did you have any say in the titles / covers of your books? How important do you think they are? Anne: They’re tremendously important. After all, the title and cover are the first things a potential reader sees. They have to compete with all the other titles and covers lined up in a bookstore. I chose the titles for all three of my books, although when Herder — the German company – reprinted Widow’s Walk the title was changed to Bridge Through the Land of Sorrow. I didn’t have any say in the original cover of Widow’s Walk but I thought the artist caught the essence of the book with the picture of a butterfly, the symbol of rebirth. When the book went to iUniverse, I was sent a new cover — which showed an impossibly young woman sauntering along a forest path. I vetoed that — vociferously! My partner, who’s an artist, designed a new butterfly cover. I can’t draw any better than a five-year-old, but I am able to visualize what I want. With Ten Women my partner suggested ten circles with an image of the face of one of the heroines in each one. I insisted the cover show just one woman – a strong one – pointing upward This is what we finally did, by using Dore’s portrait of Deborah –the first woman to go on a battlefield – pointing up to the title. Morgen: Although my mother and aunt are artists (my aunt professionally), it skipped a generation. Tell me to draw a person and it would be a mix of stick limbs and round bodies. I can replicate fairly well and especially love drawing cartoons – I have a loft with boxes of art equipment for when I have time (ha!). What are you working on at the moment / next? I’m also working on several children’s stories and recently got into blogging, which I love doing. What an opportunity to vent about issues you care about. Morgen: Blogs are great. I’ve been running this one since March 2011 and have just set up four new ones – all online writing groups welcoming critique and where I post daily writing exercises – see https://morgenbailey.wordpress.com/online-writing-groups). Do you manage to write every day? Anne: I try to write every day, but the juggling act with social media gets in the way. I haven’t figured out the best way to schedule time. I tried writing in the morning, and saving afternoons for PR and the various media, but it didn’t work. Once I start writing, it’s hard to stop. Morgen: I’m exactly the same; I have a calendar reminder on my Mac which tells me to write at 1pm daily but I usually laugh and switch it off. On the days I’m actually writing when it appears, I put a comment on Faceboook – it happens too rarely. That said, I usually do some red pen critiquing while I’m walking my dog which I’d type up. The red pen session next Sunday (20th) will be the last one because of the online critique groups I’ve set up. I now post my notes as scanned pictures which save a lot of time, but now visitors need to be able to read my writing so not more scribbling on the move. My daily 5pm fiction slot returns on 1st February (I had November off for NaNoWriMo then December and January for editing of previous novels / collections of short stories and I’ve done less than a day!). So I’ll go back to writing the stories on the dog walks. Do you ever suffer from writer’s block? Anne: I knock on wood when I say I rarely suffer from writer’s block. When I do, I’ve learned not to panic. It’s not something permanent but a momentary resting, like the lulls between ocean waves. Morgen: I’m the same; I very rarely get stuck but when I do, I take a break and it’s easier to see what needs doing when I return. Do you do a lot of editing or do you find that as time goes on your writing is more fully-formed? Anne: “Fully formed” sounds so enviable! I do a tremendous amount of editing, rewriting. and countless revisions. Time hasn’t changed that. Maybe my standards are higher these days. Morgen: It could well be that. I think as we get more practiced (and realise how many other authors there are out there – I’ve interviewed / sent information packs to nearly 2,000! ), we need to up our game. Do you have to do much research? Anne: I love doing research. Of course I do it for non-fiction articles to check facts, but I also research for fiction. For instance, one of my novels takes place in Boston. I’d never been there, so I read a lot about the history. Still, I knew I felt that first-hand experience would be the best research. So I spent three fascinating days exploring the city. The heroine of the book is an actress, so she could have performed in the Shubert Theatre. But knowing from a research distance was very different from actually seeing the famous marquee and walking into the lobby. It gave me a much closer, more emotional way to describe her experiences in Boston. Morgen: Research has been a wonderful reason for some authors to go to exotic places. I usually say I don’t enjoy research but I am lucky these days that I have the internet. Do you have pieces of work that you think will never see light of day? Anne: Did you just hear me sigh?! Anne: Yes, I have some abortive stories that have never worked. Also a bulging file of poems, dating back to my distant adolescence. I don’t consider myself a poet – much better with fiction – but last year I rescued some of the poems. I cut one of them, about my father’s death, from three pages to one. To my amazement it was published in Mobius Magazine. I’ve also found that some stories I’d given up on become viable when there’s been a long enough time to gain a new perspective on them. Morgen: I do very little poetry (usually as writing group prompts) but I do think I have enough (of the good ones anyway) to make an eBook collection, that’s on the agenda for this year. Do you pitch for submissions and / or are you commissioned to write? Anne: I pitch. . . and pitch . . . and pitch . . . ! With luck this can lead to commissions. That happened with the editor of Caring Today Magazine. She liked an idea of mine about family caregivers, and this led to four years of assignments, plus the title of Contributing Editor. Morgen: Wow. That’s inspiration for anyone reading this who’s hesitating. You have to be in it to win it, as the saying goes. Have you had any rejections? If so, how do you deal with them? Anne: I’ve had enough short story rejections to paper the room with them! Actually I did hear about a writer who did that, but I don’t think the vibes would be encouraging if I surrounded myself with rejections. I note them in my index file and then send the piece out again. A writer friend once told me that when I mail out a story, I should address the next envelope right away. That way when it comes back I’m less inclined to give up on the piece. Rejections about article queries are a different breed. Sometimes I do give up on the idea; other times I try a different publication. It’s often productive to rewrite the query letter, give it a new slant. Morgen: I have a red folder (I think I’m at still less 30) but I although I’m not ashamed of them (I keep them to remind me who far I’ve come), I wouldn’t put them on display either. Do you have an agent? Do you think they’re vital to an author’s success? Anne: I had an agent for my first book, but she retired. I then found a second, who held the manuscript for a year on what she called her “back burner”. After I retrieved the manuscript, a third agent asked to see it, loved the writing and accepted it. A fairy-tale ending? Not exactly! She didn’t have any idea which publishers might be interested, so I had to find “feminist” ones. After a futile year or so, she gave me a carton of copies she had sent to various publishers. They were photocopied so faintly I imagine the editors didn’t even bother reading them. Many writer friends of mine have similar horror stories. Despite these experiences, I think an agent can be valuable provided he or she is a good one. By which I mean knowledgeable about the publishing field and enthusiastic about representing you. I don’t think an agent is “vital,” especially these days when so many writers are increasingly going the self-publishing route. Morgen: It’s definitely getting harder for agents (and to find one) and I know some are retiring or becoming publishers. How much of the marketing do you do for your published works or indeed for yourself as a ‘brand’? Anne: I did an enormous amount of marketing for the first two books, even though I had a publisher for the first one. These days, writers are supposed to handle much — most? — of the PR. I managed to land dozens of TV and radio interviews. On my own, I got Family Circle to print an excerpt from Widow’s Walk and persuaded an editor at Parade to plug both of my first two books. I also kept pursuing Newsday, and got a full-page spread about the books. Morgen: Wow, that’s determination (and it pays off). What’s your favourite / least favourite aspect of your writing life? Has anything surprised you? Anne: Favorite is simply being able to write. I love the freedom of freelancing, being my own boss (except for editors), Also, being able to work in my bathrobe, if I wish. Least favorite is the uncertainty with income and not having health benefits or paid vacation days. I don’t give myself vacations. What continues to surprise me is that although I’d always been a “night person,” I do my best writing in the morning — before the real world intervenes. Morgen: I’m fortunate in that I have two lodgers (paying housemates – someone asked me, on Facebook I think it was, what a lodger was, I didn’t realise it wasn’t a worldwide term) and I’m on a retainer for doing blogging / PR for a fellow author, so I can relax, although I don’t earn much over the bills so still buy own label food etc., but I get to ‘live the dream’. 🙂 What advice would you give aspiring writers? Anne: The common advice is to write what you know. I think the mantra should be: Write what you care passionately about. My second advice would be to keep that inner judge out of the room while you write. I demonstrated this when I was teaching a writing workshop. I made believe I was sitting at my desk writing and had one of the students lean over me and whisper the things we tell ourselves: This isn’t any good…What makes you think you can write? I then firmly led her out of the room, saying, “You don’t belong here while I’m writing.” It was just a bit of play acting, but the students got the point. Morgen: We are our own worst critics – having feedback helps enormously, which is really why I set up the online groups and the feedback the guests have received so far is fantastic. If you could invite three people from any era to dinner, who would you choose and what would you cook (or hide the takeaway containers)? Anne: I plead off from this because the three people would be my ancestors, the people whose genes I’ve inherited. I want to know what they were like. Love to see my grandfather and tell him I did become a writer. As to what I’d cook? I’d do them all a favor and take them out to dinner! Morgen: That’s OK. I’d have my late father as one of my three. 🙂 (The others are Roald Dahl – who my father knew – and Kate Atkinson, both quirky writers) Is there a word, phrase or quote you like? Anne: There are so many. One I’ll share is the famous Hillel quote: If not now, when? I kept reminding myself of that when I wanted to leave my job at Weight Watchers in order to freelance. An executive there told me I was foolish to give up my benefits for the hazards of freelancing, but I knew if I was serious about being a writer, it was now or never. Morgen: I’d wanted to leave my job for a few months before I did and I knew I had to make the break. It was the best thing (although I’ve worked harder than ever since then) to happen to me. I can’t imagine having a ‘proper job’ now. Turning back to your fiction, do you have a favourite of your books or characters? If any of your books were made into films, who would you have as the leading actor/s? Anne: My favorites are the ones I’m writing at the moment. When Widow’s Walk was published there were some nibbles at it for TV. The prospect fell through which was too bad because the actors suggested to play my husband and myself were Paul Newman and Joanne Woodward. I think my husband would have gotten a kick at the idea of being played by Paul Newman! Morgen: Wow! And you by Joanne Woodward presumably. Do you plot your stories or do you just get an idea and run with it? Anne: I don’t believe in plotting fiction, because it’s boring to know how it will end. You have to surprise yourself, which leads to surprising the reader. Sometimes an idea comes round from a past incident or a newspaper feature. It may also be a translation of a subterranean feeling. For instance, I wrote a story by about a woman whose child is kidnapped I think what triggered the story were my strong feelings about separations between mothers and daughters. Other times the theme may come from my generous muse, no explanation. That happened strikingly last year. I’d always written stories exclusively about women, but I wrote my first story from a man’s viewpoint. It’s about his first day in college and discovering that his assigned roommate is a dwarf. He’s horrified, but slowly realizes what a brilliant and loyal friend he has found. Where did this come from? I have no idea where the story came from, but I humbly accept my muse’s gifts. Morgen: Most authors I’ve spoken to don’t plot either, and I’m sure most of those who do find it goes off at a tangent (the characters often take over). Do you have a method for creating your characters, their names and what do you think makes them believable? Anne: I don’t have a conscious method, it’s intuitive. Sometimes a name just seems to fit the character; other times it means something to me personally. I think that the more I make the character a mixture of good and evil, the more believable she/he is. After all, none of us is one-dimensional. Morgen: Absolutely. All good is dull. What point of view do you find most to your liking: first person or third person? Have you ever tried second person? Anne: The story tells me which point of view to use, varying between first and third. I did use second once, in a novel. It’s mostly in third person, but the woman talks to herself at different times in the second person. It’s done to make a specific point. When I get stuck in writing a story, I find that trying out a different point of view gives me fresh insight. Sometimes I keep that change, other times go back to the original point of view with fresh insight. Morgen: “woman talks to herself at different times in the second person” – I love that. Are you involved in anything else writing-related other than actual writing or marketing of your writing? Anne: I’ve led a writers’ workshop for the past 25 years. These days, I teach memoir writing to different groups. I love doing this and I also learn from the exciting responses of the students. Morgen: It’s great they’re excited. I’ve been running a writing group for the last five years (I’ve just handed it over to a colleague) and it’s great that they’re there because they want to be. What do you do when you’re not writing? Anne: I try to find time to catch up on an intimidating pile of unread books. Also, I’m addicted to The New York Times crossword puzzles. Morgen: My whole house is an intimidating pile of unread books, albeit neatly stored away on shelves. Are there any writing-related websites and / or books that you find useful? Anne: No web sites I can think of, but a variety of books. The first one I read – when I was first starting out – was Dorothea Brande’s On Becoming A Writer. She stressed the importance of not talking to anyone or reading anything before you start the day’s writing, so you can begin with a clear head. I try to follow that as much as possible. Morgen: Thank you, Anne. I just added Dorothea’s book to https://morgenbailey.wordpress.com/books-other-peoples/writing-related. Are you on any forums or networking sites? If so, how valuable do you find them? Anne: I’m on Facebook, but I’m not interested in posting personal revelations or photos. However, I do post notices of a new blogs or publishing acceptances. I do the same with LinkedIn, which I find more helpful because it’s geared to professionals and has useful tips and networking. Morgen: I’m the same; I only post writing-related and useful / interesting items… 99.99% of the time anyway. Each of the online writing groups has its own Facebook group (the links are on https://morgenbailey.wordpress.com/online-writing-groups) and it’s great to have people coming together chatting about writing… and from the comfort of their homes. 🙂 What do you think the future holds for a writer? Anne: More and more ebooks, and self-publishing. It’s too early to say how much these may benefit writers. Morgen: We’re able to get our work out there without relying on an agent / publisher saying “yes”, so that has to be a good thing. Where can we find out about you and your writing? Anne: My website is www.annehosansky.com. There’s a bio, and excerpts from my books. Anne: I’ve enjoyed this opportunity to talk about writing and to discover my own thoughts about it! I hope your readers will find my experiences helpful. Morgen: I’m sure they will. Thank you, Anne. Is there anything you’d like to ask me? Anne: How do you manage to publish so many blogs??? Morgen: <laughs> by doing little else (sadly) but I love doing it so it’s not work to me. I am the first woman in the Bible, so it is fitting that I should be the one to introduce the first ten women who followed me. Still, I may seem like an odd choice since I was fashioned before there were any religions. Notice that I said “fashioned,” not “born,” for Adam told me I was formed from one of his ribs. (Imagine beginning life already a fully-grown woman!) It was a wonder to me that his skin was so smooth, no mark to show that a rib had been removed. There we were in that most beautiful of gardens, with trees bearing lustrous fruits. Adam said that the “God” who created him had given us permission to eat the fruits, except the ones on a forbidden tree in the middle of the garden. Adam obeyed, but I was tempted by that wily serpent who told me if I ate the fruit I’d become like a god myself. I thought just one taste… Isn’t that how we deceive ourselves? Since I hadn’t learned the names of things yet, I’m not sure what the fruit was. Some sages think it was figs or grapes, or pomegranates which are a form of apple. Maybe that’s why artists usually portrayed the fruit as an apple. By whichever name, I decided to eat it. The fruit was so tasty I brought some to Adam to let him taste, too. After we were banished from the Garden of Eden, Adam had to work by the “sweat of his brow” and I suffered terribly each time I gave birth. These were our punishments, which generations have had to endure ever since. Yet, being human, I think I would make the same choice again. You can’t remain like an innocent child. The knowledge we gained was of good as well as evil. How else would Adam and I have known how to love one another? Through that love we became parents of the human race. We each have to make choices and risk the consequences, as the rebellious women in the following pages will tell you. They refused to submit to what fate doled out and instead chose ways to take charge of their lives. I wish the same to each of you. In dramatic monologues, ten Biblical heroines reveal how they managed to triumph in a male-dominated world. Ranging from indomitable Sarah to legendary Esther, they confide candid feelings of faith, ambition, passion and sibling rivalry – and emerge as inspiring role models for the woman of today. 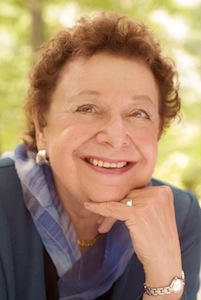 Anne Hosansky is the author of Widow’s Walk, Turning Toward Tomorrow and Ten Women of Valor. Her articles and short stories have been published in the United States, Canada, England and Australia. 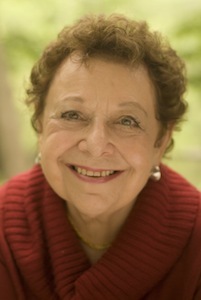 A former actress, she currently leads workshops in memoir writing.